It's been so long since I last cooked. There's a lot going on in my life right now as my career is already starting, and the rainy weather has been draining all my energy away. Just this morning the sun finally peeked and stayed throughout the day, and I saw our pandan plants (screwpine leaves) in the garden, lush and green, waiting for me to pick on their wonderful foliage. In a deep bowl, combine the chicken pieces with all the ingredients above except the pandan leaves. Leave at the fridge to marinate for two hours. Lay a piece of chicken on one end of the pandan leaf and roll tightly. The chicken will shrink a bit during cooking so it's better to roll tight. Secure the end with a toothpick. Remove the toothpicks and serve hot. 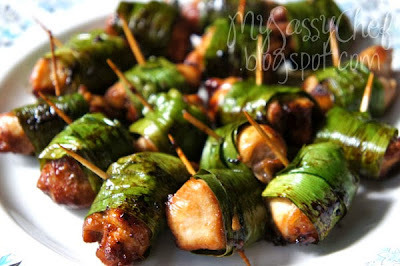 same as you, i love this dish but i have not dared making some...with this recipe of yours, i might just cook some! how r you? 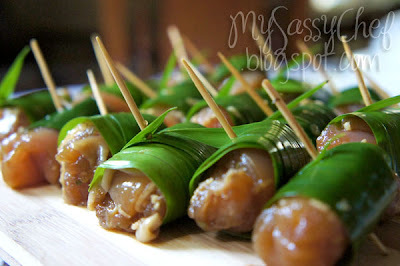 i miss your blog hun.. sorry..
that's another yummy post! i would also like to ask if you cater- meant accept some catering stuff? 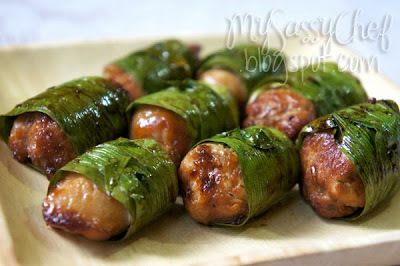 Ahhh ganito pala ang way to cook this, makabili nga ng pandan. :) Thanks for sharing the recipe. I like the smell of Pandan!!! What a lovely chicken dish and so easy to prepare, too! Thanks for sharing your recipe. Visiting late from FTF! i'm glad i took time to visit - first, i learned of your giveaway, second, I learned a new recipe that i think my son will love, he's a bit picky! thanks! And this is why i LOVE this blog! Keep on sharing the goodness! I'm interested to try this, ill check it out how it taste..